Tennessee history is rich with artifacts from native American cultures, early settlement days, famous citizens from the past and present, civil war history, and a rich cultural overlay of music, agriculture, and art.� Join our innkeepers in their local discoveries of the history-rich counties of Tennessee. Tennessee abounds with Civil War history, whether it be the chilling ambush in the mountains by renegade deserters as in Cold Mountain, or major battles.� Much of Tennessee has a story to tell, as the state was divided, both Union and Confederate.� Shelbyville was called �Little Boston�, and much of the Smoky Mountains with its rugged individualism and independent farming spirit had no interest in defending slavery and a plantation way of life.� Join the innkeepers who have created a civil war history experience in their inns and special areas of Tennessee.� I think you will be delightfully surprised at the unfolding of history before your eyes. From our inn, examine the Revolutionary War period and beyond in Upper East Tennessee. The Overmountain Men mustered from here. Later, so did a regiment loyal to President Lincoln. See the colonial/territorial governor's house of the short-lived State of Franklin (Robky Mount), as well as a recreation of a Revolutionary fort at Sycamore Shoals (Elizabethton, TN), a day trip to Tennessee's oldest town (Jonesborough) 1.3 hours away. And a look at the High Country of North Carolina's history in an Appalachian Museum in Boone, NC, and at the Moses Cone Mansion on the Blue Ridge Parkway, near Blowing Rock, NC. Caverns in and around Bristol played into the area's history. Several are open for tour. We are located in an area teeming with history. We are the closest B&B to the Great Smoky Mountain National Park and Cades Cove, a turn of the century pioneer settlement that is the most visited attraction in the most visited National Park in the United States. Cades Cove is an 11 mile, single lane one way loop road that is ringed in by mountains and dotted with old log cabins, churches, grist mills, cemeteries etc. Civil war trails in Greeneville are only 10 minutes from the cabins. 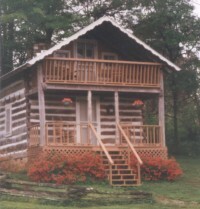 Log cabin on the grounds of 1873 operating water powered mill. Museum houses exhibits on the history of this 3 story brick structure. Built as a textile factory later used as a cotton gin then a wood working shop. The mill now produces stone ground corn meal, flour and grits. 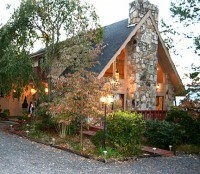 32 foot waterwheel, water falls, picnic grounds and hiking trails.